This extremely fast, short telephoto macro lens can capture the smallest details with maximum precision. The Makro-Planar T* 2/100 features a completely new optical design which incorporates floating lens elements to ensure distortion free, maximum imaging performance throughout the focusing range. As a result, this lens is well-suited for macro photography and is also a superb portrait lens. An extremely wide and smooth focusing rotation provides superior control and the fast f/2.0 aperture allows for a short depth of fi eld to draw attention to the subject. 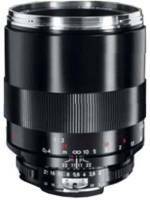 The Makro-Planar T* 2/100 is available with F bayonet (ZF) and K bayonet (ZK) lens mounts and is designed for use with full-frame SLR and DSLR cameras. When used with a DSLR with a 1.5 crop factor, the lens has an effective focal length of 150 mm.